Now that I have finally given at least a basic overview of all of the current Tokyo and Hakone Hyatt hotels, I will start focusing on some of the aspects of these hotels that stand out to me. Some of them will be big things like specific room descriptions that everybody will automatically notice, and some of them will be the things that hide in the shadows that I feel like casting a spotlight on. Today’s topic will be the latter. In my introductory post to this blog, I mentioned that, before my first stay at the Park Hyatt Tokyo, I never thought of hotels as anything more than a place to sleep. Also before my first PHT stay, I never thought of shampoo as anything more than something to use to wash my hair. Toiletries in general tended to range from stuff that I dread using (such as the Pharmacopia line in use at Hyatt Regencys in Tokyo and Hakone), to stuff that I tolerate (such as the June Jacobs line in use at the Grand Hyatt Tokyo), to stuff that I actually like (such as the Ren line that is provide with the suites at Hyatt Regency Tokyo…and which I’ve complemented to the staff so often that they now supply it for me during my regular stays as well), but they were always just a means to the end, not a destination. 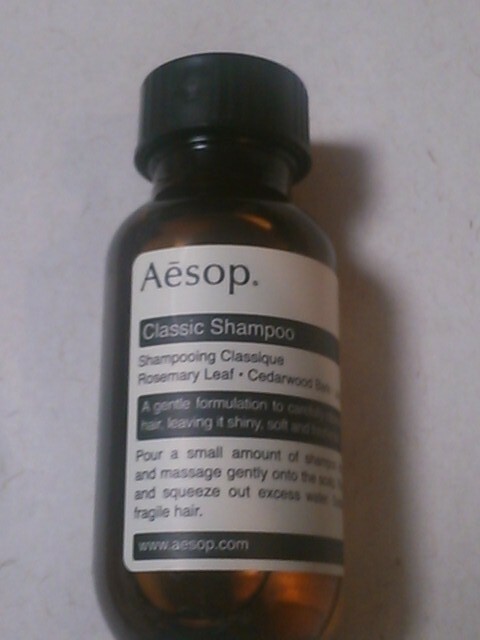 But after trying the Aesop shampoo at the Park Hyatt Tokyo, I finally knew what a shampoo could be! The soft, velvety feel! The bright white foam that develops from scrubbing, with eternal bubbles that never, ever disappear until you finally wash them away! The perfect blend of rosemary leaf, cedarwood bark, and juniper berry that envelops you in an aroma of happiness! When I use the Club on the Park facilities, and the supply of shampoo is unlimited, I can spend up to ten minutes in the shower, shampooing my hair four or five times to try and get that fragrance rush just one more time. I swear, I’m a normal guy that’s not really into fashion or cosmetics or anything much beyond convenience. This stuff simply makes a mundane experience that enjoyable for me! And that’s just the shampoo. The other stuff you get is almost just as good! 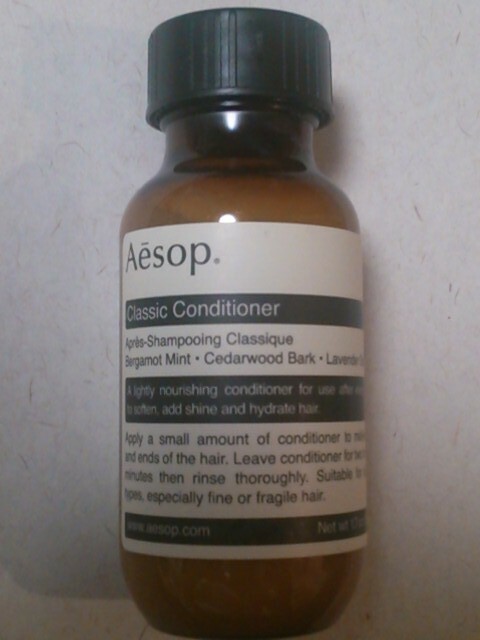 The shampoo of my dreams, this little bottle should last for about four uses for a short to medium-length haired male. But do not be shy about asking Housekeeping to replenish your supply as much as needed. I don’t use conditioner so much, so this doesn’t affect me quite so profoundly, but it does seem like good stuff. It is extremely thick though, so after your first use I would suggest that you store the bottle upside down for ease of use going forward. On the other hand, the only thing that keeps me from shampooing forever is the desire to wash the rest of my body with this stuff. Though it hasn’t yet inspired me to look up just what the heck a Geranium Leaf is. 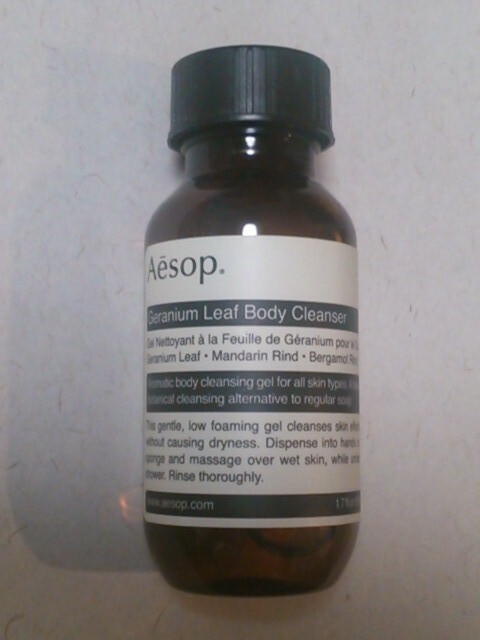 The fragrance of the soap seems to complement that of the shampoo very nicely, and scrubbing feels more like lubricating the body than washing it. 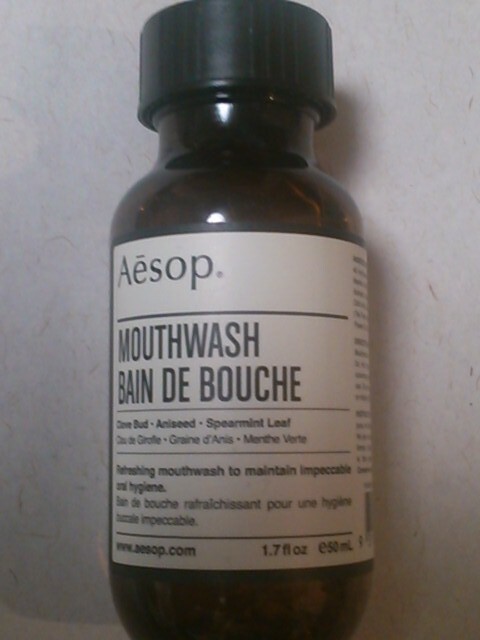 A joy to use, but it does require the use of about half of the bottle to perform a fully satisfying wash experience. Though I don’t use this very much during the course of my stay, this stuff has absolutely improved the quality of my life during the rough, dry Tokyo winters. Before using the body balm, I’d have chronic bloody knuckles by February; now my hands are moist all year round. 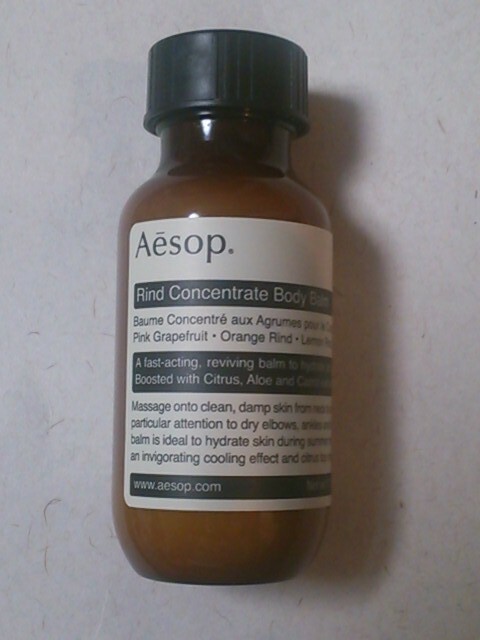 Granted, I probably could have gotten the same results with any number of other lotions…but again, no other cosmetics have ever compelled to go through the trouble of using them quite like Aesop. This is even thicker than the Conditioner, so upside down storage is a must. There are several other Aesop items available within the Club on the Park facilities, and I make sure to slather them all on me at some point, regardless of how irrelevant it may be. And, though it’s ridiculously expensive, I actually do buy replacements at one of the Tokyo Aesop shops when the urge to pamper myself is strong. All in all, thanks to the wonderful Aesop amenities provided by this hotel, I feel that I’m not getting the full Park Hyatt Tokyo experience if I’m not bathing at least an hour a day. Writing that out makes me feel the need to reiterate the need to mention once more: I am a dude! This stuff is just that good! Honest!